DHADING, July 14: More than a year and a half after the devastating earthquake of April 2015, the government distributed Rs 50,000 as the first installment of the reconstruction grant to the quake victims in the district. Some spent it on buying food and clothes while others managed to keep it safe in banks. Only a few laid the foundations of their houses and became eligible for the second installment of the grant which the government started distributing six months later in January this year. Thousands of quake-hit families are still living in huts in miserable conditions. Amid such a sorry state, quake victims are found to have been charged Rs 2,000 to 10,000 just to get the blueprints of their houses. The government had given 17 types of blueprints for those who received the grant for the reconstruction of their houses. These blueprints are supposed to be free and engineers and technicians have been deployed at the house construction sites to help the quake victims. Speaking at an interaction program held recently in Dhunibesi Rural Municipality of Dhading, a local Brinda Kandel said that engineers do not work for the victims without getting money. “They take from Rs 2,000 to 10,000 or even more for the blueprints” she said. Another resident of the municipality, Ishwor KC echoed the same concern. “They force us to pay them for the blueprints and consultation. And we have to pay certain amount. Is it necessary to pay to the engineers?” he asked during the interaction. Quake victims who attended the interaction lamented that they have to wait for engineers and technicians for months to get their work done. Some said that their ongoing house construction remained in limbo as they did not get the help of engineers on time. 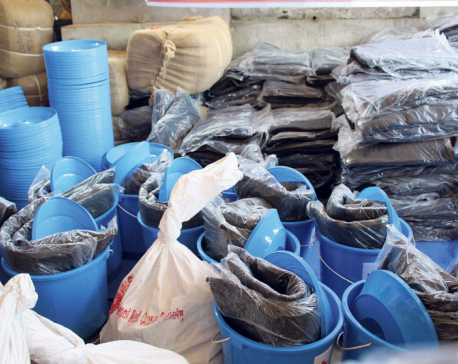 “It could be either due to the lack of human resource or the government officials’ unwillingness to help us,” said KC. However, engineers refute the charges. Engineer Jiwan Kumar Yadav, who has been deployed at a house construction site in Ward No. 3, 4 and 5 of Dunibesi Rural Municipality said, “The blueprints of the houses were distributed upon the request of the victims. We worked as facilitators. We have not taken any profit for the service,” he claimed. However, during the interaction, the quake-hit people not only accused the engineers of charging money for house blueprints. More seriously, they revealed that the engineers are not even following the 17 types of houses designed by the government. “I started constructing my house as per the design provided by an engineer. But when I went to apply for the second installment, I was told that my house does not fall among the 17 types of houses. I was told to bring a new blueprint,” said a quake victim, Keshab Mani Duwadi of Nilkantha Municipality-9. He however did not disclose whether he had to pay to the engineer for the new blueprint. “I had taken help from an engineer of my own ward so that it would be easier for me to get the remaining installments,” he added. 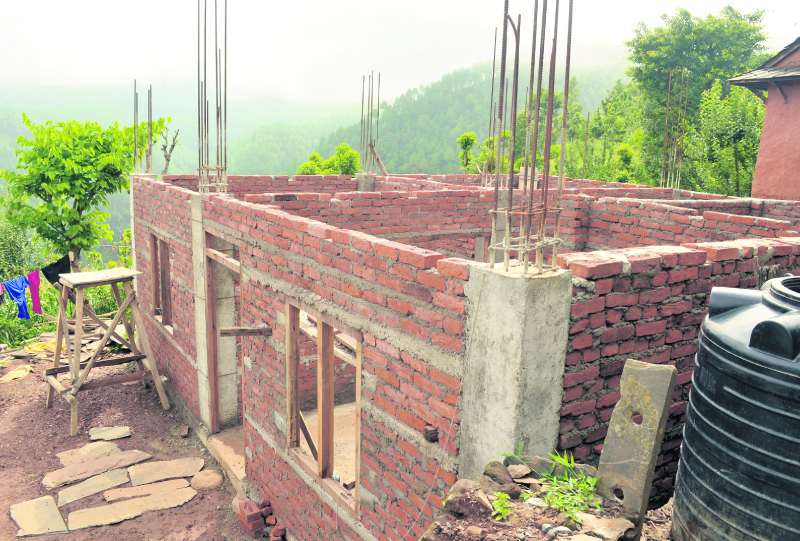 A number of quake victims are building concrete houses in this municipality. They report that the engineers do not work without money. However, they hesitated to disclose the names of the engineers. According to Dilip Bhandari, division chief of the Urban Development and Building Construction Department, it is not necessary for the victims to produce house blueprints to claim the second installment of the reconstruction grantamount. However, when they approach banks for loan, they might need the blueprint, he said. “We have found that they get a blueprint made for such purposes,” he said. Bhandari however did not like to shed light on the range of the charge. He only noted that ‘it is not a big deal if some use their skill to earn money’. “Engineers earn that way in their leisure hours in the morning and evening. This is true. But I have no idea how much they get for that,” he added. Meanwhile, mayor of Nilkantha Municipality, Bhim Prasad Dhungana said there were fake consultancies in the town that ‘no more’ operate there anyway. “We have been told about such consultancies which would claim that they are engineers from the National Reconstruction Authority and take money from victims in the name of designing the blueprints. We don’t hear of such activities these days,” he said. Engineers are supposed to go to the reconstruction sites and study everything. Then they are supposed to provide the right house design to the victims. 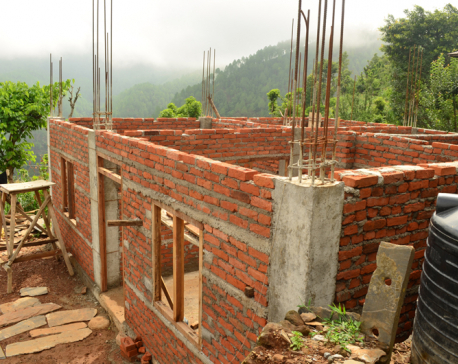 However, locals of several villages in Dhading have been doing something else about their house design. They are building their houses on their own and getting the approval from the engineers by showing them the photos of the houses under construction. On the basis of the photos clicked by the quake victims in their mobile phones, the engineers check the quality and ‘pass’ or ‘fail’ the design. “I have shown the design to the engineer. I do not know whether that would be okayed,” said Teku Tamang, a quake victim from Iwi village of northern Dhading. He went to the ward office recently along with Anjan Tamang and Basanta Tamang who had been waiting for their turn to show the photos of their houses, too. “They stay here only in the ward office. So, we have to come with the photos clicked by our phones,” grinned Sarimaya Tamang.